To celebrate International Paper Day on November 1st, what better way to celebrate than to look at some of the best words committed to paper? 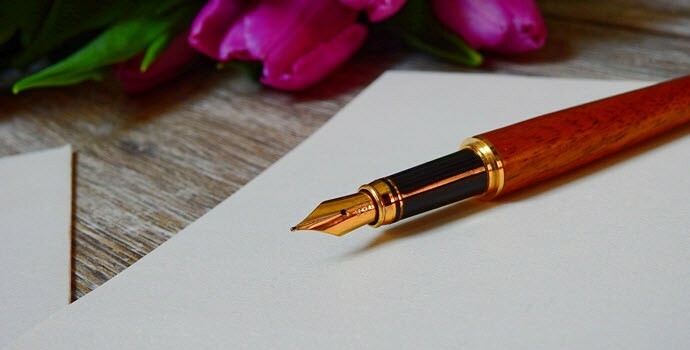 We take a look at some famous pen pals and their letters – paper infused with the most moving, insightful, shocking and endearing words. These letters between the inventor of the first “computing engine” and the woman who worked on its calculations – the first algorithms – reveal the great friendship between the two as well as Ada’s sharpness of mind. Influential anthropologist Frank Boas taught the incredible but often overlooked American writer at Barnard College. The first Black woman to graduate from Barnard and with a Bachelor’s degree in anthropology, Hurston corresponded widely with Boas about her fieldwork, which inspired much of her work including her seminal folklore collection, Mules and Men. The famous and scandalous love affair between the British naval military leader and Lady Emma Hamilton, the wife of a Diplomat, is perfectly captured in these letters. Lady Emma’s moving words scribbled at the end of her lover’s final letter to her, written on the deck of the HMS Victory during the Battle of Trafalgar and left unfinished in the wake of his death, expose the depth of feeling between them. The letters between Simone de Beauvoir and Jean Paul Sartre are fascinating glimpses into the famous couple’s philosophy and marriage, but the letters between de Beauvoir and Lanzmann reveal a far more passionate side to de Beauvoir. The eloquent poetry of Woolf stands in stark contrast with the blunt honesty of Sackville-West’s heartfelt prose but there is no doubt of the love these incredible, inspirational writers shared. The letters between these two famous literary figures are as earthy and passionate as you would expect from two authors with the canons of work they had behind them. Their letter writing outlived their affair – adding to the tumultuous insights into their private lives their correspondence delivers. There often seems to be a gulf between the man and the legend in these letters to his wife, Clemmie, but their correspondence offers a fascinating glimpse not only into their relationship but into the troubles with which the influential leader grappled during some of the darkest hours of history. Literary fans will be gripped by the correspondence between the twentieth-century poet and critic which reveals the creative and editing processes in action. It might be the most unlikely pen-pal coupling of the American century, but Groucho Marx and TS Eliot wrote to each other for three years before abruptly stopping after they met for the first time. Eleanor Roosevelt’s legacy as America’s longest-serving First Lady and as a tireless campaigner for social change glosses over the complexities of the marriage between her and President Franklin Delano Roosevelt. Only recently has her relationship with journalist Loreta Hickok been acknowledged through the release of the personal and romantic correspondence between the two women.